Italian Interior Minister Matteo Salvini reacted to news of a Senegalese migrant allegedly setting fire to a bus full of schoolkids to protest Italy closing its borders by announcing he'll be stripped of Italian citizenship under the recently passed "Salvini Decree" if convicted of terrorism. 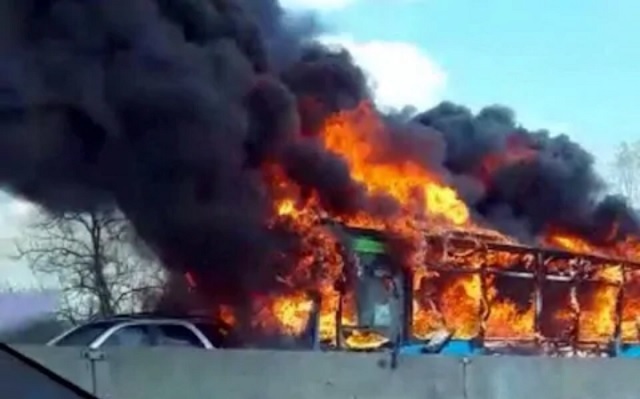 Senegal-born Ousseynou Sy, 47, hijacked a bus full of Italian children on Wednesday and rammed through a police blockade before setting the bus on fire and telling the children inside "no one would survive." "A girl interviewed by Ansa said the man kept repeating that 'people in Africa are dying and that it was the fault of Di Maio and Salvini,'" EuroNews reported Wednesday. "If there is a charge for terrorism, in case of conviction, thanks to our Security Decree we can revoke his Italian citizenship," Salvini said Thursday on Twitter. "This villain has to pay for everything." Alessandra Bocchi reported Thursday that Sy uploaded a video to YouTube calling for Africans to "rise up" and punish Europe for it's "unacceptable politics."